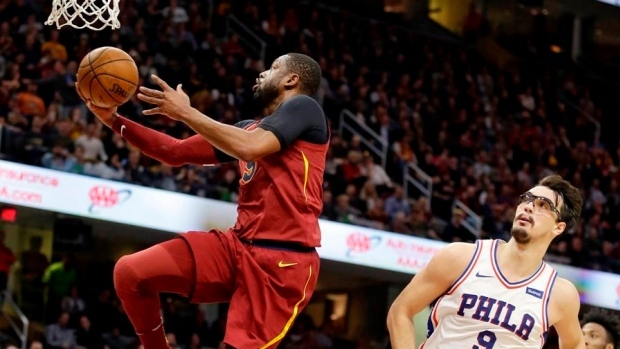 CLEVELAND — Cavaliers guard Dwyane Wade is sitting out Tuesday night's game against the Hawks because of a sore left knee. Coach Tyronn Lue says Wade has been experiencing knee soreness during the last few games and underwent tests following Tuesday's shootaround. The decision was then made to sit him. Wade, who plays point guard on Cleveland's second unit, is missing his second game of the season. He is averaging 11.5 points and shooting 46 per cent. Lue says centre Kevin Love will return after sitting out Saturday because of a strained left hip. Center Tristan Thompson will come off the bench and play for the first time since Nov. 1. The Cavaliers went 16-3 without Thompson, who was out with a strained left calf. Cleveland has won 14 of 15 going into the game against Atlanta, which is tied with Chicago for the worst record in the league.